For the next three weeks, we are going to be getting prepared for smoking turkey and ham on that big Thanksgiving day.. the biggest smoking day of the year. I get more emails, more questions, and more feedback during the month of November than any other month of the year bar none and this has been consistently true for the past nine years that we have been online. It's a big day folks and you guys feel the pressure to produce a wonderful tasting smoked turkey for the family and friends that show up at your door. I understand that completely and I commit to doing everything that I can to help you turn out the best turkey and/or the best smoked ham you have ever tasted. This first week, I am going to show you how to stuff bacon butter under the skin of the turkey before smoking it to moisturize that breast meat while it cooks in the smoker. 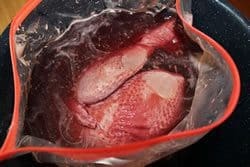 During the next two weeks, I will be showing you how to do a deconstructed version of the bird, a butterflied (spatchcocked) version and we'll even get into double smoking a little ham. Don't miss the list of questions and answers below the main article. Brining a turkey is one of the most important things you can do for your turkey to ensure that it is juicy and tasty. I am not a scientist and I do not claim to fully understand exactly how it works but then, I don't really need to. The results are fantastic and that's all that matters. 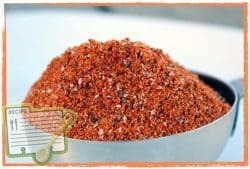 Over the years, I have come up with several really good brines and I have included the recipes below. You do have options! My personal favorite is the buttermilk brine but the cranberry brine is also very good. If you just want something really simple to make sure the turkey is moist and flavorful, then the traditional brine might be for you. ​Pour the water into a large plastic foodsafe container. Add the salt and stir until it is completely dissolved. Then add the brown sugar and rub and stir until it dissolved as much as possible. If you do not have a container large enough to handle 2 gallons, you can mix it up 1 gallon at a time by halving the recipe. 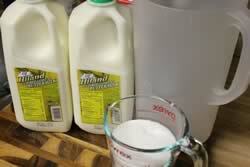 ​Pour the buttermilk and water into a large plastic food-safe container. Add the salt and stir until it is completely dissolved. Then add the rub and stir until it is dissolved as much as possible. If you do not have a container large enough to handle 2 gallons, you can mix it up 1 gallon at a time by halving the recipe. Pour the juice into a large plastic food-safe container. Add the salt and stir until it is completely dissolved. Then add the rub and stir until it is dissolved as much as possible. If you do not have a container large enough to handle 2 gallons, you can mix it up 1 gallon at a time by halving the recipe. Once the turkey is finished brining, remove it from the brine, discard the brine and rinse the turkey really well under cold water. Pat the turkey dry with a paper towel. We are going to be using a concoction that I came up with consisting of my rub, butter and bacon, several of my favorite ingredients. We will put this under the skin where it can actually flavor the meat as well as the skin. Place all of the ingredients in a food processor and run it until the butter is smooth. 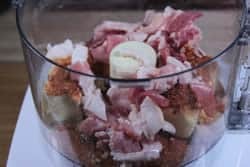 You may be able to use a blender for this if you don't have a food processor but I have not tried it and I don't know how well it would puree that bacon. Stop occasionally and scrape down the sides to make sure the end product is well blended and smooth. You could make this ahead of time if you wanted, form it into a log then store it in the fridge until you needed it. I simply made mine while the turkey was brining. In order to get the bacon butter under the skin, we have to use our hands to separate the skin from the meat all along the breast. The skin is pretty tough but still be gentle enough so as to not tear it if possible. Once you can get in there with your hands, begin stuffing the soft bacon butter under the skin by the handfuls. Push it down into the areas all around the breast and even onto the legs if you can. Once you have it under the skin, rub the remaining bacon butter onto the outside of the skin for good measure. 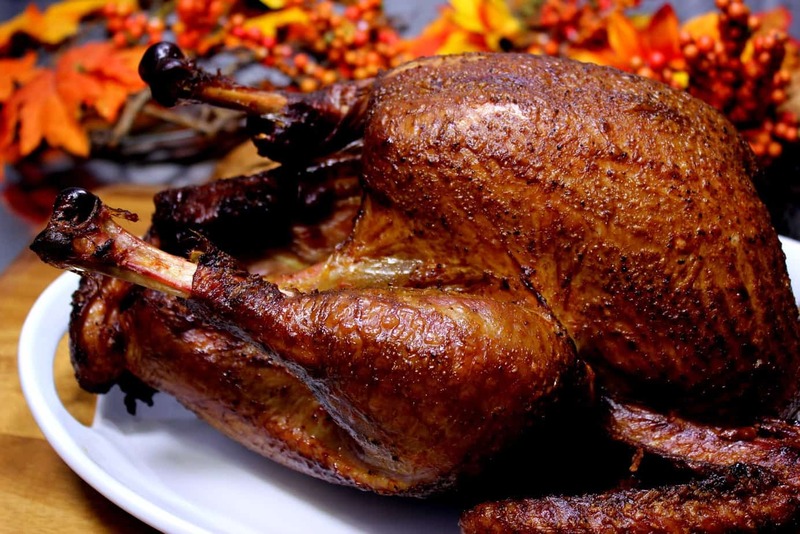 You can use ANY smoker to turn out a great turkey. Some smokers are easier than others but it all comes down to heat + smoke for a prescribed amount of time. My turkey was about 12 lbs so I planned on it taking about 6-7 hours. Regardless of the plan, it doesn't come out of the smoker until it reaches 165 degrees in the thickest part of the thigh. I moved the Bradley smoker close to the kitchen for this exercise since that is the smoker I wanted to use. I tend to use the Bradley when I need or want to smoke something but don't have time to stand right there and watch it all day. I have had this smoker for several years now and I've used it year round with very few problems. Use a water pan if you have one and I recommend a good flavorful smoke such as cherry, hickory, apple, maple, etc. depending on what you have available. I used cherry in the Bradley. 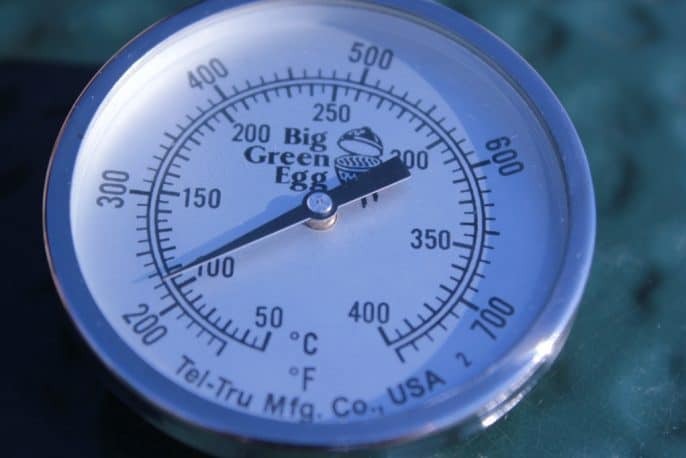 Once your smoker is setup and maintaining 230-240 degrees, it is time to get that turkey on the smoker. I usually smoke the turkey breast side down for a couple of hours and then flip it over to breast side up to make sure it does not get too much heat and dry out but, for this one, I left it breast side down the entire time. My thoughts were that the bacon butter will obviously melt and run downhill.. if the breast meat is downhill, well then that's exactly where I want the bacon butter to be. I wanted the turkey to be as high and away from the heat as I could get it which was the 3rd rack from the bottom. I left it alone for the better part of 5 hours and when I checked it, it was reading 150 degrees in the thickest part of the thigh. Right on schedule! 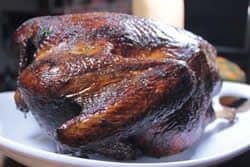 To get that really nice mahogany color and more good flavor on the outside of the skin, I mixed up some butter, rub and chopped parsley and brushed that onto the outside of the turkey a couple of times during the last hour or so. Melt the butter in the microwave then mix in the rub and the parsley. Brush onto the turkey generously. When the turkey hit 165 degrees using my new ChefAlarm thermometer by Thermoworks, I removed it from the smoker and set it on the counter. Let it rest for about 20-30 minutes if possible before carving to allow the juices to redistribute throughout the turkey. Does brining make the turkey salty? Mine never do. I am not one to use a lot of salt on my foods.. I prefer low salt most of the time and the turkey never tastes too salty for me. Can you brine a turkey that is already enhanced with a solution from the factory? Yes,I have done it many times and it always works well. What about injecting instead of brining? I don't care as much about injecting as I do brining but, then, that is a personal thing. If you do decide to inject, add as much as you can at about 1 inch intervals on the breast, legs and thighs. I just inject at a 45 degree angle slowly pulling out the needle as the plunger goes in. Some of it will come out but much of it also stays in there and does it good. Be sure to wear an apron and face mask and watch out for geysers. What is the best kind of turkey to buy? I recommend a minimally processed, fresh, never frozen turkey if you can find one. If you cannot find one, all is not lost, just use what you can find and it will be ok in the end. 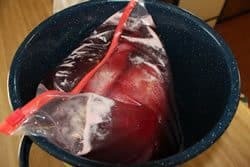 Does the turkey have to be refrigerated while brining? Yes, the turkey must be kept below 40 degrees during the brining process to prevent spoilage. This can be accomplished by refrigeration or by adding ice to the brine. Use a thermometer to ensure proper temperatures are being maintained. 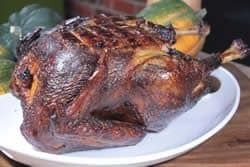 How long do I need to keep adding smoke to the turkey? 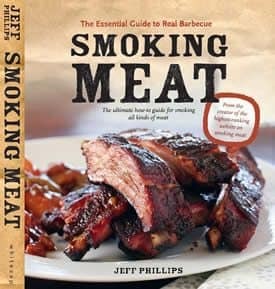 My minimum recommendation for smoking is to keep the smoke going for at least half of the estimated cook time. 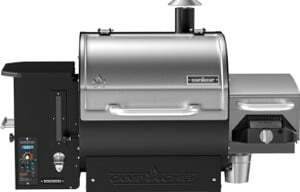 With a charcoal, electric or gas smoker you may want to consider keeping the smoke going the entire time for extra smoke flavor. Is it better to smoke a large turkey or two smaller ones? I have always recommended keeping the size of the turkey to 12 lbs or less for safety reasons. You do not want the bird to take so long to cook that it becomes unsafe during the process. For this reason, you should figure out how many pounds of turkey you need and then split it between two smaller ones if you need more than a 12 lb bird. For instance, Let's say you need 20 lbs of turkey then I would recommend that you purchase two turkeys of about 10-12 lbs. 10-12 lb turkeys will take about 6-7 hours to finish even if you have more than one turkey in the smoker. Can I put stuffing in the turkey when smoking like I do in the oven? Only AFTER it's finished cooking… NOT before. For safety reasons, the inside of the turkey should remain open to allow it to cook properly before stuffing it. Make the dressing on the side and stuff it in the turkey just before serving if you want to stuff the turkey. What is the best way to travel with the turkey? When the turkey is finished cooking (165 degrees F) wrap in foil then double wrap with thick towels. 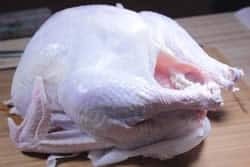 Place the wrapped turkey down into an empty ice cooler. Fill in any remaining space with more towels, throw pillows, newspaper, etc. to further insulate it. This should keep the turkey above 140 degrees F for 3-4 hours. 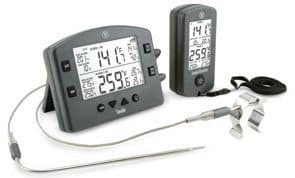 Be sure to use a digital probe meat thermometer attached to the turkey to ensure that proper temperatures are maintained during travel time. Be sure to give yourself some padding when cooking the turkey. It is easy to wrap and keep hot if it gets done a little early so figure your time then give yourself an extra 60-90 minutes. 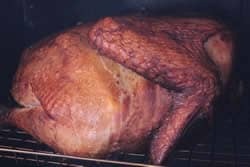 Figure the time to cook a turkey at about 30-35 minutes per pound at 240 degrees F.
Consider explaining to folks that they might see a pink tint to the meat and that this is a result of the smoke on the meat and not undercooked meat. This is better than leaving folks wondering about it. I tried the bacon butter last year to very good results! I did cook at a higher temp, so technically not smoked, but it was do e in an Egg, so it still had great flavor. My tips on the bacon butter – freeze the bacon and then it is very easy to chop into small enough pieces. Brought to room temp before i put it into a little cheapo food processor and it handled it no problem. I just served this yesterday. As usual, Jeff’s recipes make my guests happier than I could do on my own. For my brine with this recipe, I used the remaining brine from when I cooked the bacon wrapped turkey loins two days prior while adding some salt and water for enough volume to cover my 15lb turkey. Otherwise, I followed the recipe as directed. 7 1/2 hours after putting the bird in the Traeger, I served what might be the best thing I’ve ever cooked. One thing I am thankful for during this Thanksgiving weekend is Jeff and all of his smoking advice. 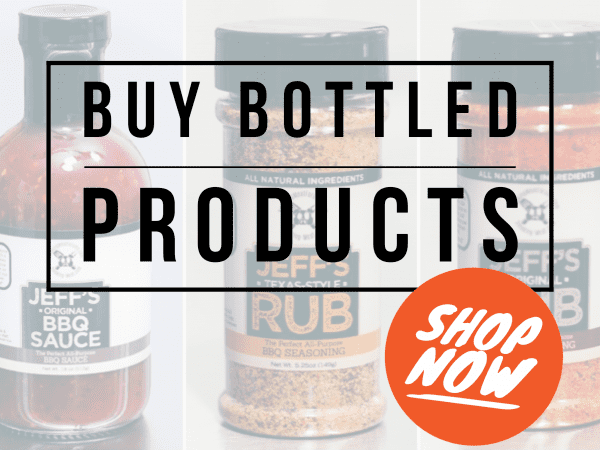 Buy his rub and sauce recipes! He has multiplied the value of the meat I have cooked under his guidance 10x or more. I used the bacon butter on a 15 lb turkey last year. I used my blender, with the bacon chopped finely before adding it to the blender, and it worked just fine! I had 6 people for dinner, and there were only crumbs and the bits left on the carcass left over. And the leftovers, boiled off of the carcass, along with the giblet gravy and some vegetables translated into a VERY delicious turkey pot pie! I’m going to do it again this year! Jeff, the butter bacon turkey looks amazing. I’d love to try it this year but already have a 22 lb turkey. 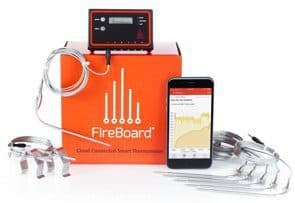 Knowing this is less than ideal for a slow cook – would the recipe work on a medium-high heat cook (300-325)? Yes you can. It’s not “smoking” temp per se but you can cook a bird at 350. Hello Jeff! I have a question regarding time to smoke the turkey. 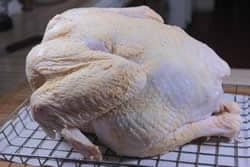 I bought a 13.66 lb bird this year (couldn’t find anything smaller) and brined it in the buttermilk brine and followed the instruction for the bacon butter turkey. Using the formula 35 min per lb at 240 degrees, it should have taken about 8 hrs to reach internal temp of 165 degrees. Correct? However, after five hours I checked it and it it was at 180 degrees! My turkey last year finished a couple hrs early too, but I chalked that up to the smoker temp being higher than I thought but I know it was right this year (I am using a brand new MES 30″). Any thoughts on what I am doing wrong? How about a printable copy of the bacon butter turkey recipe? HOw to I get the printable recipes? 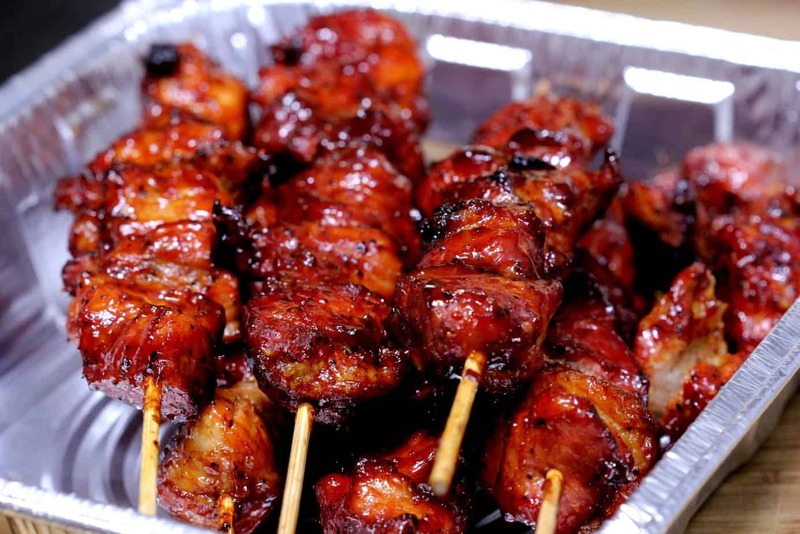 Example, the smoked Maple Barbeque turkey recipe has a printable recipe but the other recipes do not. I have to cut and paste to consolidate the recipe. I only started doing the printable version about a year ago.. the ones older than that are not as easy unfortunately. I apologize for the inconvenience and will get those fixed as soon as I can. So its been 2 years and still no printable version? Highlight, copy, paste into Word, print. 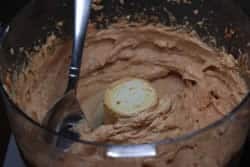 I tried the bacon butter mixture in my blender. Almost burned it up. Had to do it in small batches and that worked ok. I also softened the butter to room temperature and that made it easier to blend. I did burn my blender out. Changed the recipe by cooking and eating the bacon and using the bacon drippings in the bacon butter instead! Great flavor and much easier! 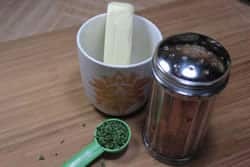 I just finished making the bacon butter mixture using a blender also. As a Fireman, smoke doesn’t scare me and the blender put out plenty. If you love your blender, stick to pancakes and margaritas and use a food processor for pureeing bacon. With all that being said. It worked! The bacon butter is a waste of good bacon. My test run ended with caked pink mushy bacon goo under the skin that was unfamiliar to my diners causing them to question the meal. I am going to try this recipe this year. In the past, the skin on my smoked birds have been rubbery and not crisp. What am I doing wrong? How does the skin turn out in your Smoked Turkey with Bacon Butter method?? At smoker temperatures, the skin will not get crispy so you just try to get it to have a good “bite through”. Allowing the turkey to dry in the fridge for a couple of hours after brining and before you place it in the smoker does a lot of good. Great! Thanks for the tips, Jeff!! I just reviewed the comments section and someone asked but I didn’t see a reply. The bacon butter – in the picture above it does not appear the bacon is cooked. Is that the case or should it be? The bacon is not cooked. I made the bacon butter turkey this year for thanksgiving, 7.5h at 250 degrees…thanks a lot, the best turkey we’ve ever had! Hi Jeff, Happy Thanksgiving. I am warming up the smoker as I type this to smoke ribs, pulled pork and a bacon butter turkey. 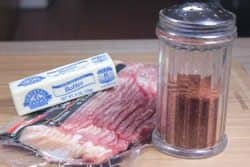 And your rub and sauce will be in mix on it all! My question is about the turkey. The big meal is tomorrow. Do you have some advice on how to store and reheat the turkey to ensure it comes out still moist the next day? Thanks for the recipe and the help. 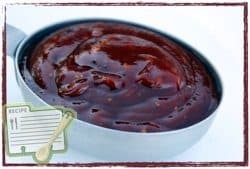 Here is an excerpt from the latest newsletter that should help you out..
..just as soon as it reaches 165°F, place it into a roasting pan with the lid off and let it cool for about 25 minutes. After cooling, cover the turkey with a large piece of foil, place the lid on the roasting pan and place it in the fridge. Keep it cold (less than 40°F) while you travel. 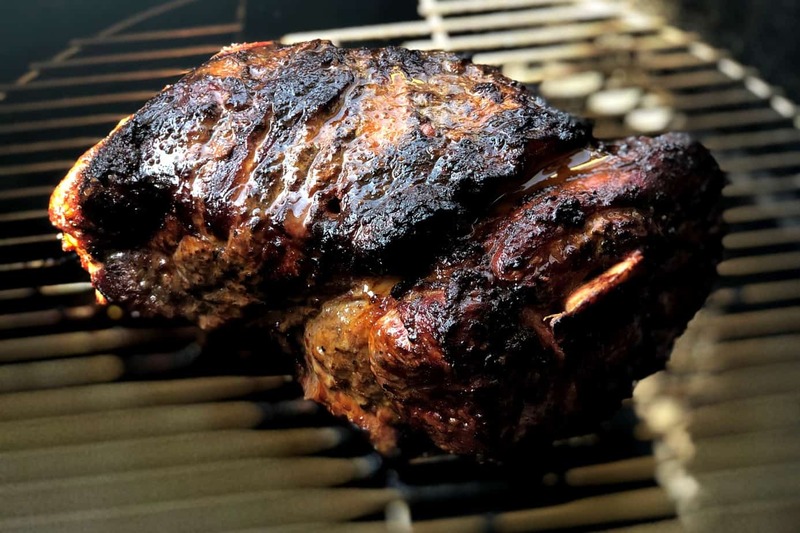 ..about an hour before you are ready to eat, pour about ¼ cup of water down in the bottom of the roasting pan for humidity (prevents the meat from drying out) and if you have any extra maple/rub sauce from the smoking process, take it with you and baste the turkey again. Place the entire roasting pan in an oven preheated to 350°F. It should take about 1 hour to reach a good eating temperature but if it gets done early, just turn the heat down to 170 °F and hold it there until you are ready for it. Keeping the lid closed, adding the extra moisture and basting again with the maple sauce will revitalize it and it will be nearly as good as it was right out of the smoker. Jeff – we are expecting 3 inches of snow on Thursday so I will not be smoking, can I still use the bacon butter if I am roasting the turkey in the oven? Absolutely! Almost all of my recipes can be reproduced in the oven with great results if, for some reason, you are unable to use the smoker. Have you ever injected your bacon butter? Does that have a good result? It will definitely work as an injection with great results. 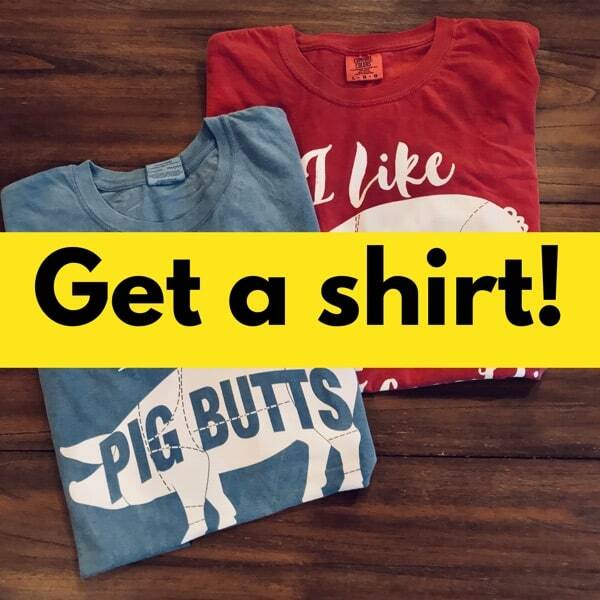 The reason I am writing is your Bacon-Butter turkey recipe……. Mmmm Mmmmm GOOD…… and a terrific success this Thanksgiving! I just wanted to pass along a couple of comments; 1.) You were correct to question the use of a blender. A blender does not work very well in preparing the bacon butter….. BUT, if you add just a touch of warm water, it will work (and puree) nicely…… and 2.) I used the buttermilk brine and Maple wood this year, and 'DAD-GUM' that’s good! A perfect marriage for this recipe! I was very pleasantly surprised. Give it a try! Made two of your Smoked Turkey with Bacon Butter using the butter milk brine. I cut the turkey up before brining (two hindquarters, two wings, one breast with part of the back bone, and one boneless breast that I rolled up and tied after brining). I smoked in my Bradley with cherry wood for about three hours. The internal temperature wasn't getting up to where I wanted it, so finished half in the oven and the other half on the grill in-direct. This turkey was the BEST turkey I have ever eaten!!! I am going to do two more at Christmas! Thanks, Jeff for another awesome recipe! Thanks for the recipe! Made one smoked bacon butter turkey for Thanksgiving should have made three so we would have had leftovers. Probably the best I have ever cooked. 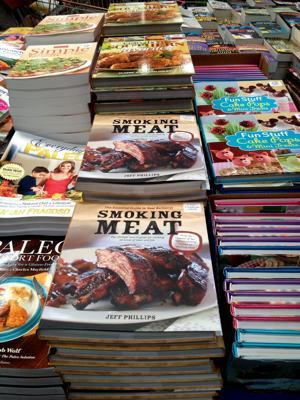 Thanks Jeff for all the great advice, recipes and sharing your passion for smoking.You a master! Happy Holidays to you and yours! I made the bacon butter last year, had quite a bit left, so I wrapped it in wax paper and it has been in the refrigerator all year. Can anyone tell me if it is still good? I bought a 17 lb bone in ham intending to smoke it for Thanksgiving. I know 225 but how long exactley. Im going to use pecan wood. Hi yall, I used the buttermilk brine and the parsley/butter for under the skin for last years Thanksgiving, it was DELICIOUS! My question is, does anyone know if the leftover parsley butter is still OK? I had a bunch left, wrapped it up in wax paper and left it, forgot about it, in the fridge. So it's been sitting there for a year, still good or not? Hey Jeff you are my go to source on everything smoking and I really appreciate all of the info. I live in your neck of the woods (BA) and was wondering where in our area you prefer to get fresh turkey for your Thanksgiving smoke session. I've done frozen in the past using your specs and it has turned out great but I would like to go all in this year and try a minimally processed bird. and have not received ant e mails since. I will look into this for you and see if I can get that fixed right away.. let me know if you don’t get the newsletter this coming Thursday. Meantime you can see what you missed HERE. I always buy a Greenberg Turkey for Thanksgiving……they are the BOMB………How can I get a smoked bird like that out of my smoker??????????? When that thing comes in all cold and smokey…………well just get one and see!!!!!!!!!!!! This might be a silly question, but do you cook the bacon first for the bacon butter, or allow it to cook with the bird? 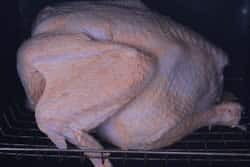 I can't wait to make this turkey. I have never used a buttermilk brine, but will give it a shot. I went to a BBQ clinic this summer and one of the most important things I took away from it was safe cooking. There are two safe zones for food…below 40 degrees and above 140 degrees. 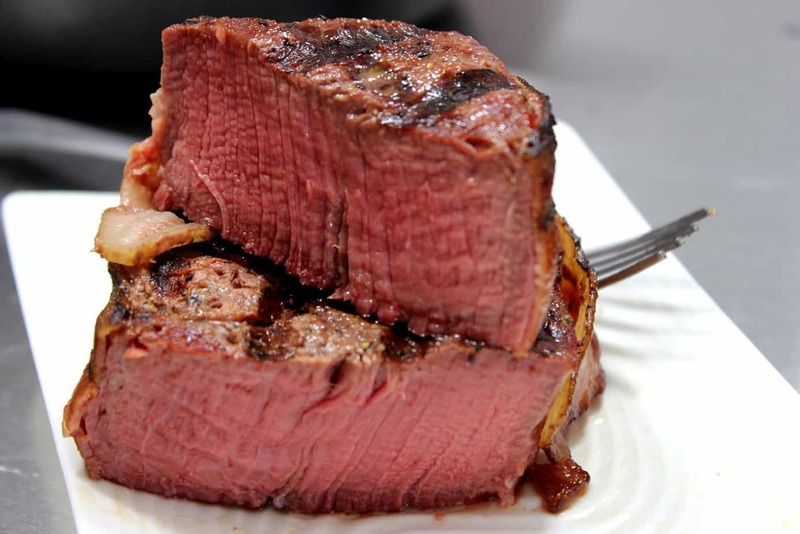 When dealing with food, especially meats and other proteins, you have 4 hours to get it from one zone to another. That is why I won't do large turkeys or big pieces of meat…it takes too long to get from 40 to 140. Some good info to pass on to your readers. Thanks for all the great food ideas and your tremendous rub and sauce recipe! hi jeff i love your page it has give me some great things to try and put some smiles on lots of faces with your help. i just got the article about bacon butter turkey and it sounds great, but what do you think your favorite way to smoke turkey is?? Next is a question about the article. you sid it needs to be 165 deg. at the thickest part of the theigh. i have always taken my temp from the breast. 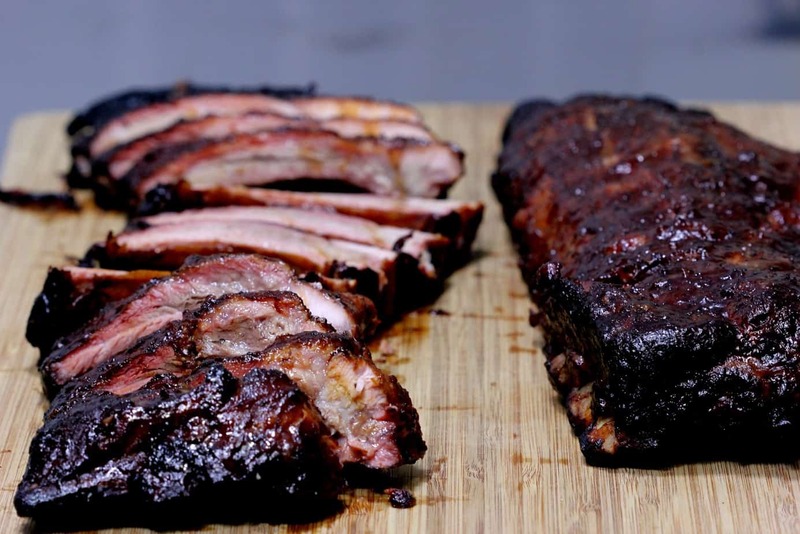 wouldnt it be so much more meat and take much longer to get to temp or have i been missing out on a really awsome tip that i wish i would have know of along time ago? keep up the great newsletters and i do have your rub formula and love it.